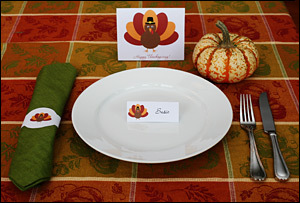 Original and exclusive printable Thanksgiving napkin rings by Kate.net! Fun either for the main table or the "kiddie" table. These match the printable place cards and the printable standing table decoration. In order to download this sheet which is in PDF format, you'll need the free Adobe Acrobat Reader. Most people already have this on their systems. Click on the image provided to open the page. Then, once opened, either click on the printer button within Acrobat to print the page, or go to the 'File' menu and select 'Print.' You can use regular paper. Cut around the lines of the napkin rings. Wrap one around each napkin, securing the backs of the paper napkin rings with tape or non-toxic glue stick. Decorate your table! Fun for the main table or the "kiddie" table. These napkin rings are © Kate.net. This page may be printed for personal use; however, it may NOT be offered or distributed elsewhere in any format (may NOT be put on other web sites, etc. ), whether commercially (for a fee) or for free, NOR may portions of this page or its images be modified or used in other graphics or products. You may NOT link directly to this download; however, you are welcome to create a link to this page's URL. Thank you! Then, just print! See assembly instructions above.